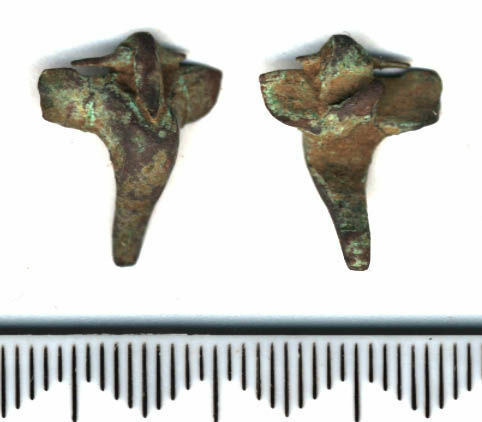 Copper alloy brooch fragment, Colchester type. Upper part only, missing spring and pin; very corroded. The forward-facing hook survives, now corroded onto the top of the bow; this retains a minute scrap of spring chord. Small stub of spring also survives. No surviving decoration. Wings curved in section, D-section tapered bow running down to old break. Surviving width 14mm, length 14mm.